"Probably none of us imagined it would be like this." A cornerstone in the New German Cinema movement, by the mid 1970s, prolific German director Rainer Werner Fassbinder had already produced over twenty-four features for screen and television. With the commercial success of 1971's The Merchant of Four Seasons and the international recognition of Whity, he had moved from his early "anti-theater" work into less theatrical productions, furthering his international reputation with the acclaimed 1974 Ali: Fear Eats the Soul (Angst essen Seele auf), which took the International Critics Prize at Cannes. Originally working under government sponsorship, his approach may have been industrial, but his aesthetic and narrative skills, coupled with his unique perspectives on human observation, create a fascinating body of work. 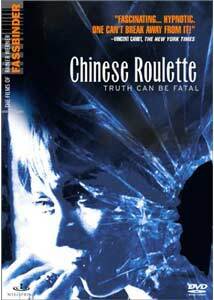 His stage background is not completely dismissed however, as the fourth of his 1976 films, Chinese Roulette (Chinesisches Roulette), uses a traditional introductory framework to set up what is essentially a one set climax, centered around the parlor game the film derives its name from. The film opens at the Christ household, where the seeds are planted for this dysfunctional family to face the truths about itself. Husband and wife Gerhard and Ariane are each packing for a weekend trip, purportedly for business matters, but in reality they are heading off with their respective long time lovers. Their affairs are no real secret, but have been veiled by a mutual deception to keep them discreet and inoffensive. While away, their daughter, Angela, a rather spoiled girl crippled since early childhood, is to remain home under the care of her matron, Traunitz, but the young lady has different plans. Believing his wife will be out of town and under the guise of going himself, Gerhard instead arranges to meet his mistress, and take her to the family's summer mansion. However, the house already has guests, which Gerhard soon discovers as he interrupts his wife and her lover in the throes of passion on the parlor floor. Their arrival sets off the housekeeper, Kast, a cruel and cranky old woman, who senses foul play in the goings on around the house, as well as her son Gabriel, an aspiring writer, who is hoping to exploit Gerhard's connections to get his work published. The awkward situation is compounded when Angela and Traunitz also arrive later that day, as the stage is laid for a night of suspenseful revelation when Angela suggests playing Chinese Roulette, a team guessing game, setting in motion a provocatively deadly chain of events. Fassbinder delivers a riveting psychological thriller here, full of biting humor, bitter ironies and quirky twists. It has a decidedly European feel and resolution, with a wonderful strangeness and depth to its characters. The seemingly simple premise unfolds its layers of complexity, as the motives and intentions of the players come to light. The cast does a great job in creating the tense atmosphere, in particular, Fassbinder staple, Margit Carstensen as the vengeful mother who blames her daughter for ruining her life, and Andrea Schober as the cunning child who manipulates the adults into a frenzy of hatred and bitterness to her own ends. The direction is focused and deliberate, the execution enhanced by the ornate location, and the stylistic cinematic flourishes provided by the team of Michael Ballhaus (Satan's Brew) and Horst Knechtel who would follow up with work the director's Bolwieser (The Stationmaster's Wife). With Peer Raben's intriguing score providing the backdrop, many scenes play out in one shot, allowing the actors to interact in a very natural manner, playing off each other while heightening the tension between them with lingering pauses, as the camera sweeps through the set, constantly reframing. If there is a downside, it is perhaps the game itself, which, while an interesting device, tends to drag a bit in its length. While it may not be among the director's most celebrated work, nonetheless, Chinese Roulette provides a darkly humorous tale of family secrets, moral hypocrisy and the seemingly inevitable volatility of the situation. Image Transfer Review: Wellspring presenst Chinese Roulette in an anamorphic 1.66:1 transfer, which was supervised by the Rainer Werner Fassbinder Foundation, Juliane Lorenz and Wim Wenders. For the most part, this is a gorgeous transfer, with strong colors, excellent detail, and a very filmlike quality in its grain structure. The print is relatively free of defects, and only a few shots look a little too soft in comparison. Audio Transfer Review: Original German audio is well presented, generally clean other than a bit of oversaturated music near the beginning. Dialogue is clear, hiss and distortion are negligible. Extras Review: Extras are pretty light, consisting of a Fassbinder filmography, a trailer for Beware the Holy Whore and a catalogue of other Fassbinder titles available on DVD from Wellspring. The insert provides the richest supplemental content, with a lengthy essay on the director by author Thomas Elsaesser, though it is not specific to the film, in fact does not mention it at all, being originally written the year of its production. There is also a page of weblinks available on DVDROM. Although there is rarely a mention of this title in his biographies, Fassbinder builds a taut psychological thriller in this suspenseful satire of a bourgeois married couple whose infidelities are exposed by their crippled child. A well-crafted script and exquisite cinematography highlight performances from an excellent ensemble cast. Recommended.